Our complete Parts Department features thousands of appliance parts in stock for your repair and replacement needs. We offer the manufacturers’ warranty on all parts we sell for GE, Whirlpool, Frigidaire, Maytag, KitchenAid, and more. Our Expert Protection packages offer extended service plans for your purchase after the manufacturer warranty runs out. Extended service plans can prove invaluable if the product requires repair or replacement parts. You can’t put a price on peace of mind. 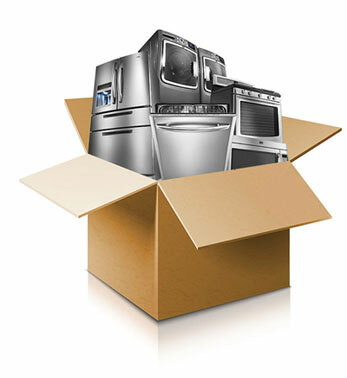 Our delivery and installation specialists will assure that your new appliance arrive safely and are installed properly. The new appliance will be tested to make sure it works correctly and all packing materials will be removed from your home. Any questions or needs you may have will be handled promptly and professionally. Professional installation is recommended on certain products, and in some cases necessary to ensure warranty protection coverage. Our Customer Service Representative can help you decide which installation options are best for you. And, be sure to ask about possible delivery incentives and/or rebates available in your area. Our Expert Protection packages offer an extended service plan for your purchase which can prove invaluable if the product needs repairing or replacing of parts, and coverage of the labor. Eliminate all of the irritations associated with restoring your equipment to peak condition. Make one toll-free phone call to the Expert Protection service support center and they will provide fast, efficient service. The package covers the cost of all covered repairs and if for some reason they cannot repair the product, they will replace it!